Christmas is coming soon. When we talk about Christmas, some people think of gifts under the tree, some think about Santa Claus and his reindeer, some think about Christmas carols or twinkling lights or holidays. All of those things are great, but most of us know that the real reason for Christmas is Jesus. Christmas is where we celebrate and remember the birth of Jesus. It’s a time where we can stop and think about how much God must love us if he was willing to send us his Son. That’s a pretty great thing to think about. Today, we’re going to go back a long, long, long, long time ago to the city of Jerusalem — about 700 years before Jesus was born. King David loved God. When he was king, Israel followed God’s way. But after King David, there were many, many other kings who weren’t so good. They stopped following God; so the people also stopped following God. And they got into all kinds of trouble. They were attacked by their enemies and the nation split into 2. So … Jerusalem at that time was not a happy place to live. The people’s hearts were frozen and hard. They were sad and scared. They felt like they were alone. It seemed like God had abandoned them. But the good news is, God never abandons His people … even when they reject Him and don’t want to listen to Him. God sends a prophet named Isaiah to us. A prophet is a man or woman who delivers a message from God. And the message Isaiah gives us is this: God loves you. And because He loves you, He wants you to have hope. He wants you to turn your frozen heart into a heart of love. And the best news of all: God will send the world his Son, a new king who will rule forever. The Savior of the world. Isaiah tells us that we have been walking in darkness (like a cold, frozen land, where there’s no sun light). It’s hard to know where to go when the way is dark. But he describes meeting Jesus as “seeing a great light.” Isaiah uses many words to describe Jesus. He calls him a Wonderful Counselor, Mighty God, Everlasting Father and Prince of Peace. The people of Judah were looking for a new king. A strong and powerful King who would protect them from their enemies. God had promised David that He will give Israel a forever King. Jesus was this forever King. God let the Israelites know, through Isaiah, that Jesus would be their Prince of Peace. In most kingdoms, the regular people can’t just go up to the king anytime they want. But Isaiah tells us that Jesus is our Counselor. That means we can come to him anytime we want and talk to him, share our troubles, seek his help. Isaiah also tells us that Jesus is our Mighty God. Jesus is a strong king who can handle any problem we bring to him and can help us through every scary time that we face. The words Everlasting Father remind us that we are God’s children and Jesus’ love for us will never end. Isaiah delivered a pretty terrific message to the people. It was a message that they really needed to hear. The people were sad and afraid. They needed hope. They needed to know that God loved them. They needed to know that Jesus was coming. Sometimes we’re sad and afraid too. We might feel hopeless. We might need reminding that God loves us. When those times come, we can always turn to Jesus for comfort, strength, love, and peace. Jesus can turn our frozen hearts into hearts of love. Dear God, Thank you for sending people into our lives that tell us about Jesus. May the message of Christmas give us hope and peace. In Jesus’ name, Amen. Memory Verse: Isaiah 9:2 The people walking in darkness have seen a great light; on those living in the land of deep darkness a light has dawned. Game: Print out 2 sets of the memory verse on 2 different neon coloured paper. Cut them up and hide around the hall. Divide kids into 2 groups. Turn off lights and give each group 1 flashlight. They have to search for their group’s coloured paper then arrange the memory verse in correct order. Christmas-themed craft with memory verse. E.g. 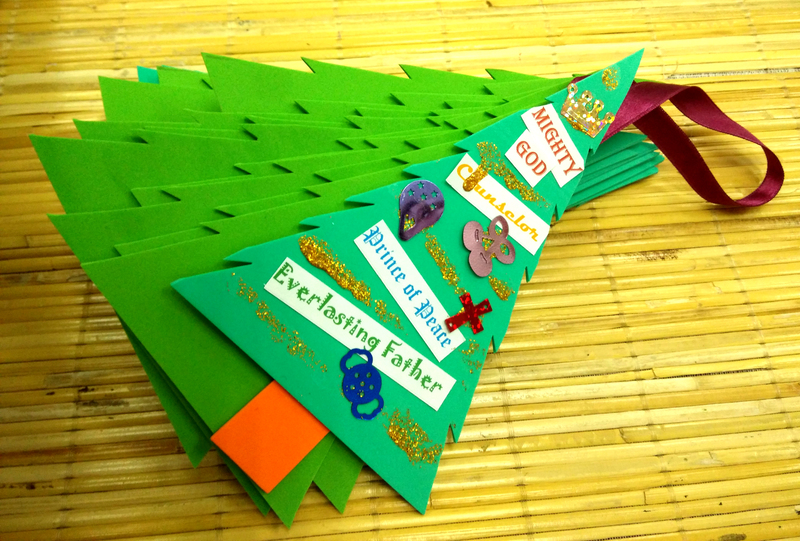 Stick the words “Counselor”, “Mighty God”, “Everlasting Father”, “Prince of Peace” on a Christmas tree picture.